Was NASA's Voyager 2 'hacked' as it entered deep space? 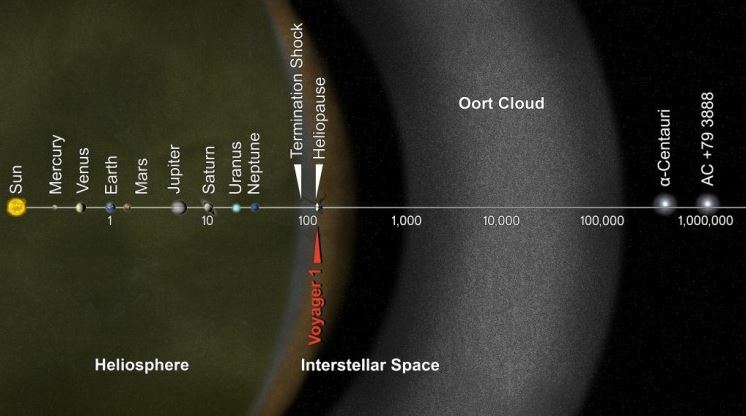 As Voyager 2 –one of the most distant manmade objects in space— approached the outer reaches of our solar system in 2010, something completely unexpected occurred. Scientists found that as the spacecraft was approaching deep space a single digit in the binary code of the command system aboard the Voyager 2 spacecraft was changed. A ‘0’ was flipped to a ‘1’. The spacecraft started sending data in a language scientists didn’t understand. Someone or something altered the Voyager 2 communication system. NASA’s Voyager 2 is an unmanned spacecraft that is on an epic journey through space. It was launched on August 20, 1977, and its primary goal was to study outer planets. After successfully completing a number of missions within our solar system, its mission was extended to study the outer reaches of the solar system. The spacecraft has been operational for nearly 40 years. The spacecraft is officially located at a distance of 112.5 Astronomical Units from the Sun. It is one of the most distant man-made objects in space and scientists expect that the spacecraft will reach interstellar space sometime between 2019 and 2020. While the spacecraft continues its long journey to outer space, it turns out that in 2010 someone or something altered Voyager 2’s communication system. A binary code was altered. As it turns out after scientists diagnosed the problems they discovered that a single digit in the binary code of the command system aboard the Voyager 2 spacecraft was changed. A ‘0’ was flipped to a ‘1’. According to reports, this means that some unknown party actually interfered with the spacecraft’s onboard computers. But who did it and why? Was it a random glitch? Voyager 2 carries a message from Earth in its journey towards outer space. If an intelligent civilization encounters the probe somewhere in space, it is very likely that they’d understand it. Is it possible that the binary code flipping was a response from aliens? According to German ufologist Hartwig Hausdorf, the answer is yes. Researchers solved the issue in a matter of days by resetting the computer onboard the Voyager 2 that caused the unexpected data shift. The change in the data return pattern has prevented mission managers from decoding science data. However, Aliens aren’t always the ones to blame, or are they? As it turns out these data flip may have occurred because of other things as well. But, it still remains a mystery as to why only ONE component of the spacecraft was affected and not the entire system.